Low-dose atomic resolution imaging of K2PtCl4. (A) The atomic model of the K2PtCl4 unit cell, with K in cyan, Pt in purple, and Cl in pink. (B) Bright-field TEM image of a large K2PtCl4 crystallite. (C) Diffraction pattern of the K2PtCl4 crystallite in (B) after it is tilted along the (001) zone axis. (D) Atomic resolution low-dose TEM image of K2PtCl4. Dose fractionation was done using an electron dose of 1 e/Å2·s, with 0.1 s for each image. Sixty-four images were acquired, aligned, and averaged. The electron dose then becomes 6.4 e/Å2. The atomic model is overlaid in the inset. (E) Simulated HREM image of K2PtCl4 with a thickness of 12.3 nm. (F) A zoomed-in image of K2PtCl4 from a sub-area in (D), and the intensity line profile in arbitrary units (a.u.) from the red box, is shown in (G), where the intensity from Pt atoms is located between two Cl atoms. Credit: Science Advances, doi: 10.1126/sciadv.aau9590. A key to materials synthesis is the ability to control the process of reduction kinetics and nucleation (phase transition) in materials. Understanding the reduction dynamics during the initial stage of material synthesis is limited due to the difficulty of investigating chemical reactions at the atomic scale. This is mainly because the chemical precursors used to synthesize materials can degrade when exposed to electron beams that are typically used to image compounds at atomic resolution. In a recent study, now published in Science Advances, interdisciplinary materials scientists Wenpei Gao and co-workers in the USA and China, studied the reaction kinetics of a solid-state platinum (Pt) precursor compound. In the study, they used an aberration-corrected transmission electron microscope (TEM) combined with low-dose electrons and in situ imaging. 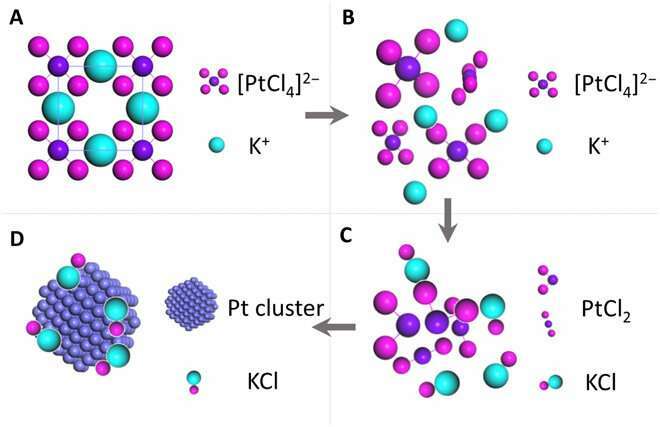 The scientists imaged the beam-sensitive Pt precursor; potassium tetrachloroplatinate (II) (K2PtCl4), at the atomic resolution to determine the individual atoms (K, Pt and Cl) involved in the synthesis of platinum nanoclusters. Gao et al. captured the material's transformation to Pt nanoclusters in real time to show three-stage reaction kinetics, including (1) breaking of the ionic bond, (2) formation of PtCl2 and (3) reduction of the divalent Pt to Pt metal nanoclusters. In the new method, the scientists combined techniques to understand the transformation of chemicals at the atomic scale in real time without damaging the substrates and provided a new platform to study reaction kinetics. Gao et al. captured, identified and revealed the dynamics at different stages of decomposition, reduction and nucleation of the material. The work allowed them to understand the transformation kinetics of platinum from precursor to nanocluster as a promising avenue to study atomic-scale reaction dynamics. In colloid and synthetic chemistry, materials scientists aim to control the shape and size of nanoparticles to achieve the desired properties of electronic, optic and catalytic materials. Nanocluster nucleation is a key process of growth kinetics in the solid state of materials synthesis. Manipulating the kinetics has allowed the synthesis of a group of nanoparticles shaped as nanorods, nanocubes, octahedra, octopod-shaped nanoparticles, icosahedra and other surface features. While nucleation is the initial step in materials synthesis, it is difficult to control nucleation kinetics without understanding how atoms interact. Platinum nanoparticles are usually synthesized in a liquid-phase reaction with C-H or Cl- as a precursor. During growth in such a system, the precursor is reduced by the reducing agent to form metal monomers with atomic arrangements based on metal-metal interactions. However, a microscopic mechanism that details the intermediate reaction steps is yet unavailable. As an alternative to materials synthesis in the liquid phase, nanostructures can also be grown in the solid phase. Studying the reduction process in the solid state can decipher materials transformation for fine control of materials synthesis. Understanding the kinetics of materials transformation from precursors to nanostructures at the atomic scale based on ionic bond breaking is therefore of considerable significance. The scientists opted to study the nucleation process in the solid phase without the liquid environment using characterization tools of X-ray nanodiffraction and TEM, which offered ultra-high resolution. The method resolved the evolving structures in real and reciprocal space, although the sensitivity of most chemical precursors to the electron beam due to photo illumination had previously made it nearly impossible to observe the initial atomic structure of the precursor. For TEM observation, K2PtCl4 was first dissolved in deionized water in preparation to image its crystal structure. In the bright field TEM image, the crystallite was 50 nm x 60 nm in size. Gao et al. weakened the electron beam dose to the angstrom scale for less than 1 e/A2∙s to limit beam-induced sample reduction during the process of imaging. The scientists conducted high-resolution electron microscopy (HREM) at 300,000 x magnification to obtain 64 images from the same area. By averaging the images, the atomic columns were clearly resolved in the study. 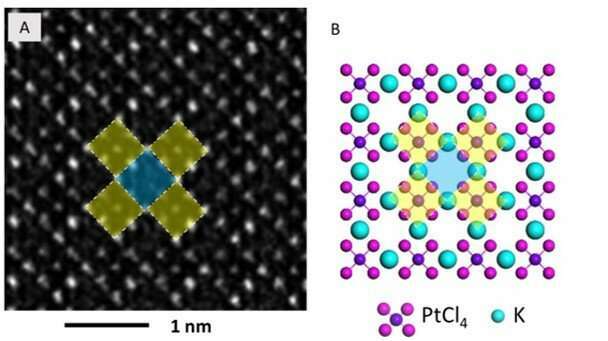 The high-resolution TEM image showed periodic lattice squares with an atom (yellow) surrounding those without bright atomic contrast (blue) in the center. Gao et al. compared the atomic resolution images with the existing atomic structure of K2PtCl4 to identify each individual element. The scientists identified the atoms in the corners as potassium (K), atoms in the middle of the edges of the squares as chlorine (Cl) and those in the center of the square in yellow as platinum (Pt). When Gao et al. increased the electron beam dose to 30 e/A2∙s, the lattice from K2PtCl4, which was originally viewed across the entire area developed into individual Pt clusters. 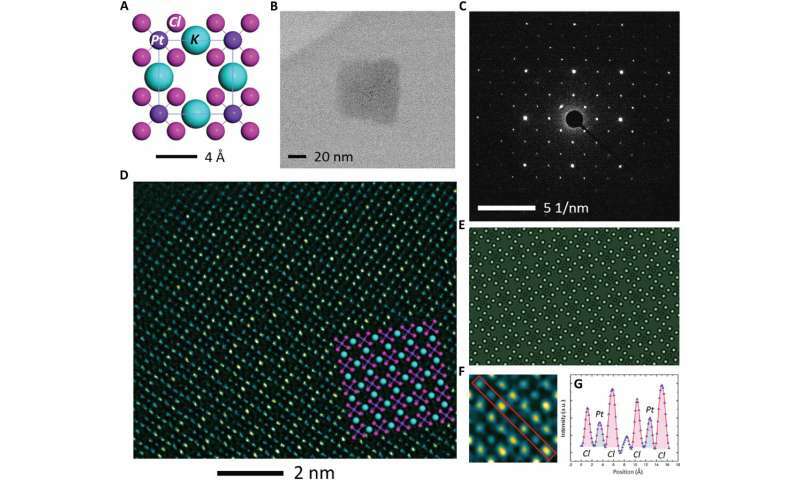 In time, the nanoclusters grew more pronounced under the microscope. They then observed further formation of the Pt nanoclusters across extended time periods under low-dose imaging conditions. 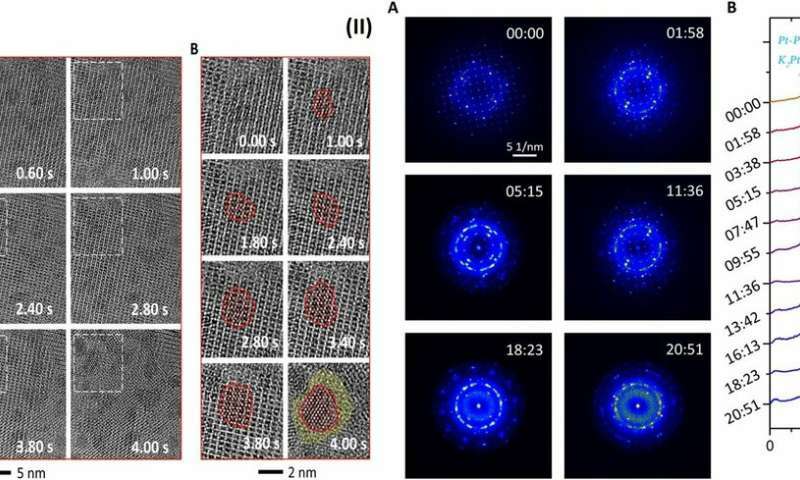 The scientists selected a sub-area of the sequential images and applied a fast Fourier transform (FFT) to discern the structure and the constituents. Gao et al. were able to obtain a time series of FFT patterns in the K2PtCl4 lattice, which also reflected the radial distribution function (RDF) (to find adjacent particles). The scientists then investigated the additional surface orientation of atoms in the material, aside from the Pt nanoclusters, to understand the location of K and Cl species. 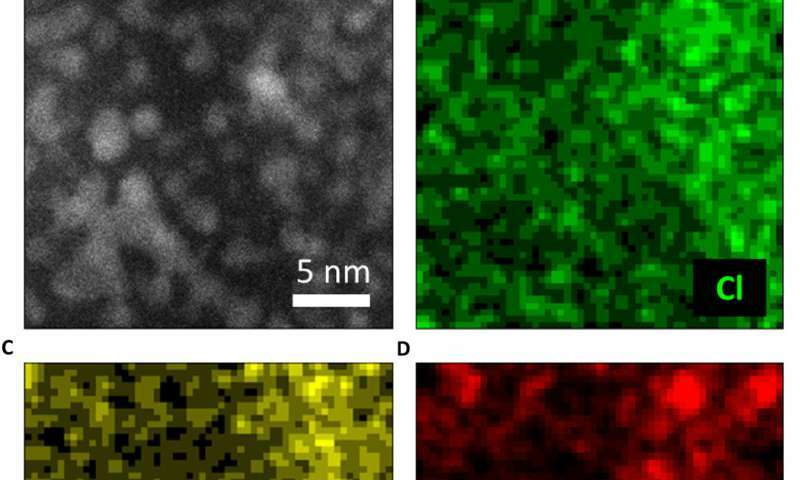 In the work, they used a series of imaging and analytical methods of materials science, starting with high-angle annular dark-field (HAADF) scanning transmission electron microscopy (STEM) and the 2-D energy-dispersive spectra (EDS) map to characterize the material. The results showed the signals from K and Cl in the background as evenly distributed across the area. When the scientists used electron energy loss spectroscopy (EELS) they further observed the existence of K and Cl from KCl, after the formation of Pt nanoparticles. Gao et al. gathered sufficient information from the reaction dynamics captured in real space via spectroscopy and characterization techniques in materials science. They proposed a microscopic process of reduction kinetics for K2PtCl4. Accordingly, the precursor K2PtCl4 first decomposed in to K+ and PtCl42- by breaking the weak ionic bond. A schematic showing the evolution of K2PtCl4 into Pt nanoparticles. (A) K2PtCl4, (B) dissociation of K+ and [PtCl4]2−, (C) further dissociation into PtCl2 and KCl, and (D) nucleation of Pt nanoparticles. Credit: Science Advances, doi: 10.1126/sciadv.aau9590. Then PtCl42- decomposed into PtCl2 and Cl-, a reaction which had not previously been reported in experimental studies. Gao et al. revealed this process using FFT of the high resolution image under a low electron dose and high acquisition efficiency. On removal of the K species from the precursor, the lattice became unstable and compounds including PtCl2, KCl and Cl2 could move freely. When PtCl2 was reduced in to Pt, the molecules of Cl2 transitioned into the gas phase for removal from the TEM column. The zerovalent Pt species formed small nuclei or migrated and grew into large Pt nanoparticles. In this way, the scientists elegantly demonstrated the reduction kinetics in the study and illustrated the concept using atomic models. The observed findings of nucleation and reduction of Pt agreed with that of previously calculated free energy in the chemical reaction. This method can be applied to study additional material transformations in depth. The results will benefit the applications of nanostructures in nanophysics for new materials development, new energy processes in environmental remediation and in nanomedicine.